Home IOT IoT is a Boon to the Indian Dairy Industry! 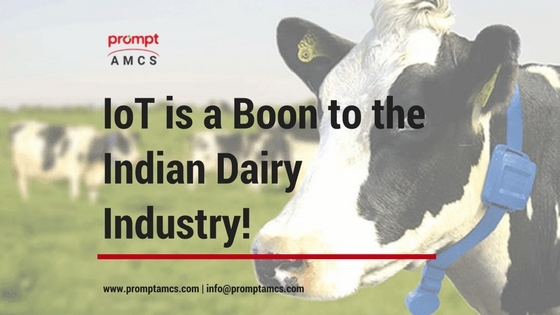 IoT is a Boon to the Indian Dairy Industry! Ever wondered how powerful the technology of the internet is that it is able to connect the entire globe with just a few threads of connection? From your mobile backup to the ginormous volume of data of a tech giant, everything is amassed up there in that little cloud and we don’t even realize how it keeps everything simple and easy for us on the fly. Gartner foresees, 8.4 billion connected "things" will be in use in 2017, up 31 percent from 2016. The strength of the internet is unimaginably immense. It is equally beneficent in all the sectors of the industry, be it Technology, Health, Agriculture, E-Commerce, Telecom or for that matter the Dairy Industry which is one of the fastest growing industries in the world. The Indian Dairy Industry has so far made a commendable progress in terms of utilizing the available technologies and at the same time, endeavoring to pace up with the rest of the world. India faced a consistent dearth of resources and lots of discrepancies before achieving independence which subsequently slumped the development of the dairy industry, though the scenario has improved to a great extent today. Now, India is one of those nations which are considered as potential prospects to expand the dairy business and extend notable growth on the graph. The country has made a remarkable advancement in a very short span of time garnering attention from all over the world, for internet has made it possible to connect the Indian Dairy Industry with the world and expose myriad business opportunities. And today, India is the world’s largest producer of milk besides being one of the leading countries to export milk products. For IoT has commenced another noteworthy era in the history of technological evolution, let us get into some of the highlights how the IoT has digitally transformed the dairy industry and why the farmers today are looking forward to making the most of the internet. It is a common sight to see the farmers working all day in the field to manage their herds. They often complain that though the milk production business yields high revenues, the job is tiring. They cannot leave their herd unattended for a long time. IoT fills these loopholes in the most modern and easy way possible today. There is animal wearable available nowadays that help the farmers to monitor and control their herd’s movement, eating activities, temperature, weight, overall health, milk production, and breeding. These trackers send alerts and notifications to the farmer that allows real-time tracking on the individual animal and also increase the milk production. And all this can be easily managed from any remote location barring the physical presence which was a compulsion earlier. Reduced time, individual attention, and better management make IoT feasible to run any dairy farm efficiently. While automation is the by far the major advantage that IoT offers, it has effectively proved to be one, especially in the Indian Dairy Industry. The introduction of automation in various activities spread across the entire cycle of milk production, collection, and procurement process has saved capital and resources big-time. It is necessary to test the milk quality to ensure its suitability for further processing. There are various milk analyzers available in the market that determine accurate values of Fat, SNF, water content, and density of milk. Such devices reduce the time that goes into testing a number of milk samples every day at the milk collection center. Additionally, various apps are also available specifically for the farmers to manage their milk business. The more digitized the technology is, the more obligatory it becomes to store and safeguard the data. When you rely on a technology to ease and automate your task, you also expect that the data is maintained at a location far from a security breach. The devices used during milk collection are connected through the internet that stores data and transfers it over to the cloud, thereby creating a safe storage for preserving the data. The data so obtained is stored at a centralized location which helps to maintain consistency and provide authorized accessibility from any remote location. By each passing day, a number of businesses are demanding cloud storage to create a data repository of their own. Gartner predicts, through 2020, IoT will increase data center storage demand by less than 3%. Ever since the ‘Digital India’ initiative has launched, the government and the industrial sector, particularly the dairy industry, are focusing on digitizing their workflow. To support this, the government has announced various policies and subsidies for the welfare of farmers and milk producers. One being the instigation of Electronic Payments by maintaining ‘e-Wallets’. The idea is that the farmers and milk producers receive their payments directly into their bank accounts eradicating the concept of middlemen which had created tremendous discrepancies earlier. The policy is aimed to end the rising dilemma of farmers against forced heavy debt circumstances as a result of irregular payments. The policy allows farmers to receive timely payments, provide direct benefits to them, and build a transparent system through a well-connected channel or medium with the help of IoT. Even today, there are many villages in India that lack apt infrastructure and resources essential to develop and oversee the dairy farms. Though there are many farms that still follow traditional methodologies to cultivate dairy farming, farmers are reaching out to using diverse technologies to nurture the same, thanks to the advancement in the technologies. Thanks to IoT, the farmers can optimize resource consumption in case of limited resources. The Internet makes it possible for the farmers to connect to a digital world where they can easily communicate to millions of farmers, receive off-premise knowledge and assistance, and improve the functioning of their dairy farms. Hence, they not only earn higher revenues generated through increased productivity but also an improved lifestyle is borne out of high satisfaction. According to a study conducted by Erik Brynjolfsson, Professor of Information Technology at MIT, he quotes, “One of the hallmarks of this new era is the acceleration of data-driven decision making within businesses, which has tripled in just five years.” As the dairy industry begins to feed a hefty amount of data available through IoT to machine-learning algorithm systems, the industry begins to make inferences and decisions fundamentally in an automated way. The dairy industry will continue to make effective decisions by analyzing vast information available instantly on the web, consumer buying behavior, and inventory purchases while moving away from intuitive thinking. More farmers, by and large, will effectually make use of the technologies in their dairy farms to escalate productivity and profitability. The Internet-of-Things (IoT) did exist before too, however, it has gained significant attention since a few years owing to the intensifying demand for critical data management. The organizations today are emphasizing on the technology for its ability to automate and augment intricate business processes and decision making. And the dairy industry is no different. The transition of the Indian Dairy Industry from being conventional to contemporary shall be governed by IoT in the coming years and the nation is looking forward to marking another revolution of the era.